Filling nail holes or patching flaws in woodworking projects is fairly easy using the various wood filler products available. What is not so easy is matching the color of those fillers to the stain used on the wood. Every woodworker is familiar with the result—an attractive woodworking piece in which the filled nail holes are glaringly visible because they are slightly different in color. The problem can occur whether you apply filler first, then sand and stain; or if you stain first and then attempt to fill nail holes on the finished work. Wood fillers typically don't absorb stain as well as the natural woods. This can result in the wood filler spots to appear much lighter or darker than surrounding stained wood. The same stain used in the woodworking piece simply looks different when applied to wood filler. If wood fillers are placed on unfinished wood, allowed to dry, and then sanded flush, they often will cause the surrounding area to appear discolored after the finish is applied. This occurs because powdery residue from the filler infiltrates the wood grain surrounding the nail holes. There are a number of techniques for dealing with these problems, and what works on one project may not necessarily work well on another. By testing on scrap stock, you should be able to find a solution that will fit the needs of your woodworking plans. On softwoods such as pine, fir, maple, and birch, it's highly recommended to use a pre-stain conditioner on the wood before staining. If the conditioner is applied before filling the nail holes, it will prevent the wood filler from being absorbed by surrounding wood and discoloring it. Keep in mind that the manufacturers of such products usually recommend applying stain within two hours of the conditioner's application, so after filling your holes and allowing the filler to dry, you may have exceeded the two-hour time allowance. If that's the case, simply apply a second coat of conditioner before staining. Also, be careful when sanding your filler so as to avoid sanding the conditioned wood around the filler. Another way to minimize the problem is to apply the wood filler before you begin the sanding steps of your woodworking project. As a result, the filler and surrounding wood will be sanded at the same time, thus minimizing the textural differences between the filled area and the surrounding stock. With a uniform texture, the applied stain will absorb in a more uniform fashion and minimize color differences. 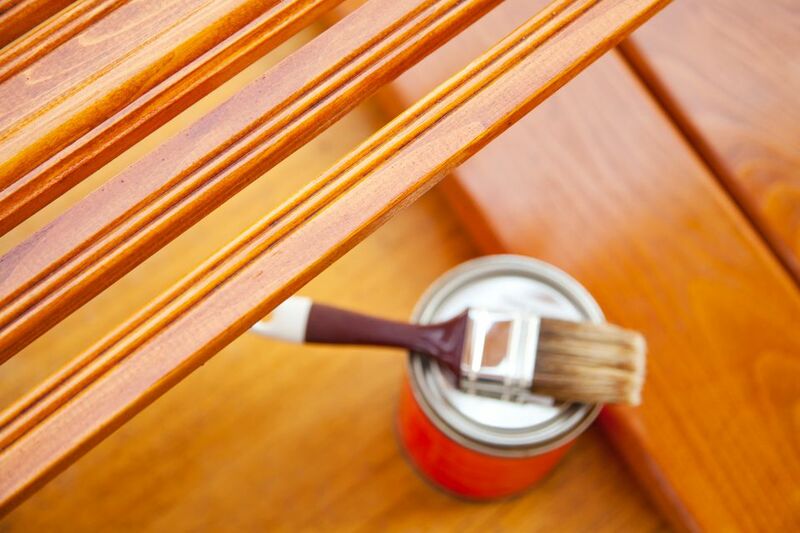 It is important to thoroughly wipe away sanding dust before staining. If your problem is that your filler of choice just isn't available in a tone that properly matches your stain, there are other solutions you can try. One of the most common is to use a powder-style wood filler of neutral color mixed with the color stain you're using on the entire piece. This technique can be used whether you choose to fill the holes before or after staining the wood, but if you choose to stain before filling nail holes, take care when sanding down the excess filler to avoid sanding down the surrounding stained areas and removing color.